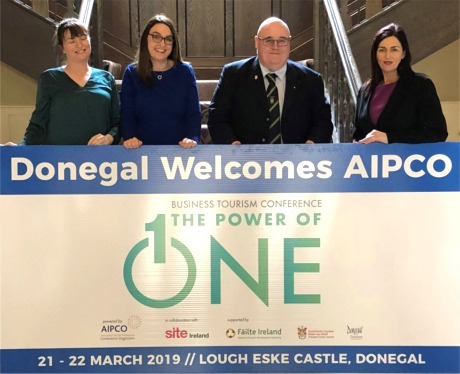 THIS year’s AIPCO Business Tourism Conference is an event for anyone involved in business tourism in Ireland and will see up to 200 delegates make their way to Lough Eske Castle in Donegal from Thursday 21st – Friday 22nd March. The Association of Irish Professional Conference Organisers (AIPCO) is a non-profit organisation founded in 1999 and is committed to raising standards of service among its members and other sectors of the meetings industry. Fáilte Ireland has called on Inishowen tourism businesses to secure their spot at the event and find out how they can tap into the lucrative business tourism market. Fáilte Ireland calls on Donegal industry to tap into business tourism. Inishowen businesses can secure a space at the conference by registering here . The event will provide a platform for businesses such as venues, hotels, transport companies, restaurants and exhibition specialists to showcase their offering and grow business tourism into their venues and portfolio of work. Businesses can secure a space at the conference by registering here .